Fun Fact! 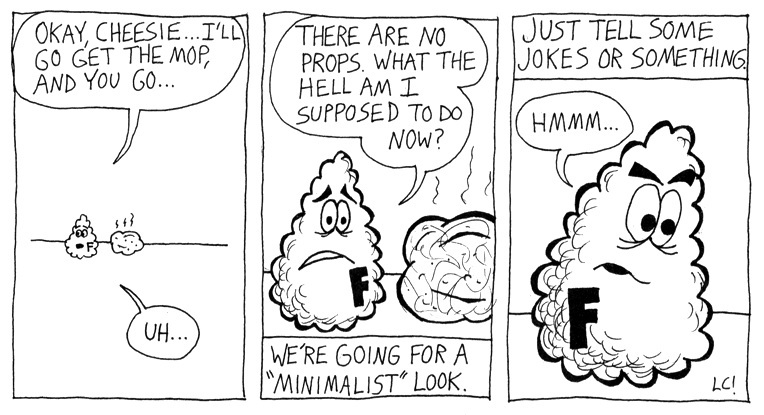 Today's strip, unlike the other installments of the "Hi-Jinx" storyline, did not appear in the original Fuzzball and Scuzzball webcomic. It was drawn later and included in the print version of the story. That's right, there was a print version. It was called Fuzzball & Scuzzball #1. You can read a review of it here: http://www.opticalsloth.com/?p=8955. The reviewer says "the funny parts were actually funny," which is possibly the highest praise these comics have received. I have a bunch of copies of Fuzzball & Scuzzball #1 in my closet, if anybody wants one. I have one! it's highly collectible and awesome.